Everything you need to know about us. Learn about our history, mission, vision, and service area. Over 200 field-proven reference books, training manuals and DVDs. This store will help you find creative ideas for your next promotion, all while making it an easy, fun experience. 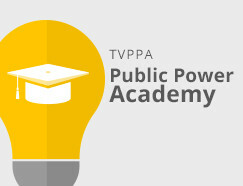 TVPPA’s Education & Training Committee is here to provide nationally recognized education and training opportunities to meet current and future electric utility workforce needs. A source of new ideas and a means of shared problem-solving for utility industry professionals, see how a TVPPA Conference can benefit you and your team. Place an employment ad or find a job opportunity with TVPPA’s Jobline service. TVPPA’s ValleyLine offers a wealth of information and will help you stay on top of upcoming events. Copyright © 2019 Tennessee Valley Public Power Association, Inc.
Use this form to find out if your membership request has been pre-approved. You don't appear to be in the pre-approved list. However, if you think you are properly qualified to register for this site, please contact Haley Gautreaux at (423) 648-4260 or email marketing@tvppa.com. Thank you, your membership request has been approved.